Artist's illustration of a hypothetical planet covered in water in the binary star system Kepler-35AB. The art of exoplanet detection is on the upswing, and scientists are perhaps at the cusp of a watershed moment — detecting life on other worlds. To date, ground- and space-based telescopes have discovered more than 3,500 confirmed planets circling stars other than Earth's sun. And that number is destined to grow. Indeed, the discovery of extrasolar planets that are about the same size and mass as Earth has opened the door to scientific debate about the probability that such worlds may be habitable. Exoplanet finds over the last few years have sparked lots of news stories with terms such as "most habitable planet" or "Earth twin" in the headlines. However, the reality is that we currently have no way to quantitatively assess a planet's ability to support life, said Elizabeth Tasker, an associate professor in the Department of Solar System Sciences for the Japan Aerospace Exploration Agency and its Institute of Space and Astronautical Science. "We need to change how we discuss habitability. We talk about habitable planets, but the bottom line is, at the moment, we don't know," Tasker told Space.com during the Habitable Worlds 2017 workshop, which was held in Laramie, Wyoming, from Nov. 13 to Nov. 17. 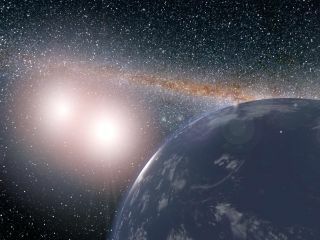 The workshop was staged by the Nexus for Exoplanet System Science (NExSS), a NASA research-coordination network dedicated to the study of planetary habitability. By implying that scientists can measure the degree to which a planet is able to support life, Tasker said, "we undermine future projects" to explore factors such as atmospheric conditions of newly found worlds. She suggested changing both the language and the metrics used in exoplanet exploration, turning toward detectability rather than habitability. During the workshop, Tasker showed off a "Watch Your Language!" poster that read, in part, "We need to change how we discuss exoplanet metrics. Unless we want to risk destroying our chance to find out if the Earth is unique, we need to stop pretending we already know." Tasker said she often winces when she hears the term "Goldilocks zone," which refers to the region of space around a star where the temperature on a planet's surface is just right for liquid water (and, by extension, life as we know it). "People get very excited when they hear 'Earth-sized' planet and 'in the habitable zone,'" Tasker said. "Therefore, they think it must be habitable, but that's absolutely wrong." All it means, she explained, is that you have a planet the same size as Earth that receives a similar level of radiation. But we don't know if it has a magnetic field. Does it have the kind of rock [necessary] to have a carbon-silicate cycle? Does it even have water at all? Talking exoplanets? Better watch what you say, advised scientist Elizabeth Tasker. "The term 'Earth-like' conjures up images of rolling hills [and] glistening lakes, and some might even start seeing Starbucks," Tasker said. "We need to emphasize that this does not mean that the planet is definitely Earth-like or habitable. I feel it would just take one sentence of clarification, and everyone would get the idea." A key issue is that exoplanet science cuts across diverse research fields. "It's interdisciplinary. We don't use the same jargon when we talk across each other," Tasker said. "Getting planetary [scientists], Earth scientists and astrophysicists to talk in the same room is one of the most exciting, but challenging areas of exoplanet studies at the moment. Let's get on the same page. We need to be careful in all areas. I think clarity is going to be the big name of the game for the next few years."